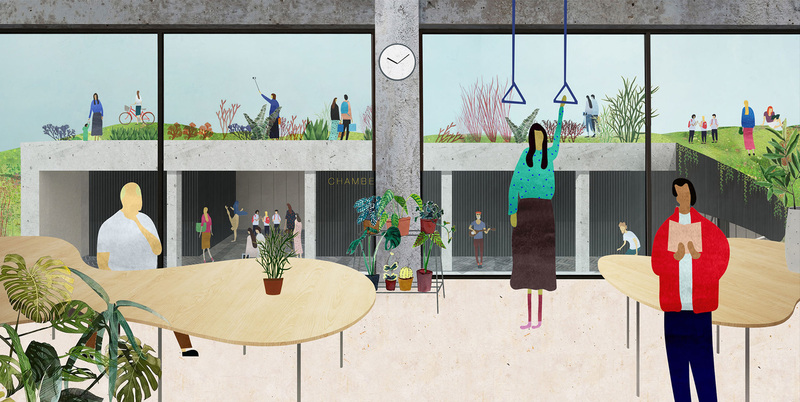 This project proposes a cultural venue with an integrated network of physiological and psychological recreation, where the indoor cultural activities and the outdoor body culture activities complete each other and are treated equally. This type of organization is reflected in the structure of the development: building and landscape complement and transfuse each other, in-between spaces become significant. According to the urban planner Kevin Lynch, some urban landmarks can be seen from a distance, whereas others whose spatial impact is limited have their place in one’s mind - on the so called mental map. As modern urban development has proved, purely hardware landmarks (high, big, shiny) don’t work unless a software (people’s behaviour) is created along to make the building perform. This project is based on our belief that the succes of the future Center for Performing Arts lies in putting the place on people’s mental map by means of a network of performing soft elements.